Food and farm entrepreneurs often have great business concepts, but still need training, technical assistance, mentorship and networking access to grow their companies. That’s why FamilyFarmed, in 2014, started the Good Food Business Accelerator (GFBA) for Chicago region entrepreneurs in the local, sustainable food sector. Now — after graduating two cohorts made up of nine entrepreneurs each — GFBA is accepting applications to join its third group of competitively selected Fellows for the intensive six-month program, which will run from November to April. The application period runs until September 19. Participants must adhere to the principles of Good Food, which FamilyFarmed defines as food produced as locally as possible using sustainable, humane and fair practices. 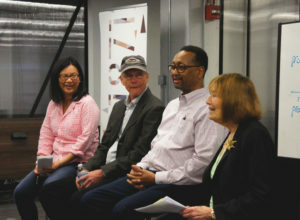 They must also be located within the Chicago foodshed and be able to attend weekly learning sessions at GFBA, located in the 1871 business incubator in Chicago’s Merchandise Mart. For more information about eligibility and criteria, please click here. And to learn more about the program, and have any questions answered before the deadline, plan to attend the Good Food Business Accelerator Application Celebration event at 1871 on September 13th at 6 p.m. Reserve your ticket now! 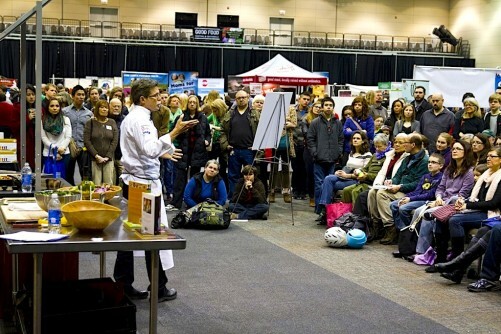 GFBA was, in fact, the nation’s first business accelerator focused on sustainable, local food. The seed for the program was planted at FamilyFarmed’s annual Good Food Financing & Innovation Conference, when investors stated that they witnessed a lot of great business ideas, but the entrepreneurs needed more polish in their plans and pitches. That is why the theme for the Accelerator program is “getting farm and food businesses ready for prime time” — meaning giving them the skills to launch or scale up. Each week, Fellows participate in customized curriculum sessions at 1871, the hub of Chicago’s entrepreneurship and business innovation. These classes are designed to help them deliver sound business plans, improve their investor pitches, and learn business best practices. Throughout the six months and beyond, the Fellows are paired with industry leading mentors, and are connected to potential customers and investors. With access to FamilyFarmed’s network and resources, Fellows further develop their knowledge and skills in marketing, operations, financing and strategy in order to thrive commercially and have a powerful ripple effect on the local economy. GFBA saw tremendous success during its first two years, as measured by gains in sales, clients and employees enjoyed by the alumni. Jim Slama, president and founder, said, “We’ve partnered with leading buyers such as Whole Foods Market and UNFI [the leading distributor of natural and organic foods]. We’ve worked with 18 entrepreneurs and helped them scale up, they’ve raised millions of dollars, [and] they’ve increased their sales dramatically”. 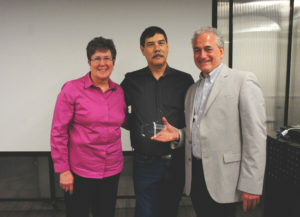 Within a few months of the first cohort’s graduation in spring 2015, GFBA businesses averaged a 62 percent increase in sales and a 107 percent increase in customers. The growth of these businesses created good jobs and spurred economic development within our community with a 68 percent average increase in full-time employees. And within the first year, Fellows raised a combined $5.62 million in debt and equity financing. Jenny Yang (left) of Phoenix Soy, a leading Chicago tofu maker, has launched a major expansion with the assistance of FamilyFarmed’s Good Food Business Accelerator. Here she discusses the program’s first year at GFBA’s second graduation ceremony in April 2016 with Harry Carr of Mint Creek Farm, Thomas Frierson of Spark of the Heart, and Charlotte Flinn, Family Farmed board chairman. Jenny Yang of Phoenix Soy, LLC, a Chicago producer of excellent Phoenix Bean tofu and other soy-based foods, was a first-year GFBA Fellow (2014-15). She said joining GFBA was “a historical moment” in her life.” The most important part for her was the network that she gained from GFBA — including an introduction to Whole Foods Market, which now carries her products in all 52 of its Midwest region stores — which helped her business grow and scale up in a major way. Susan Fink (left) of Karma Kombucha was featured in a Chicago Tribune feature about the Good Food Business Accelerator. Here she receives a gift from Whole Foods Market Midwest President Michael Bashaw (center) and FamilyFarmed President Jim Slama at the April 2016 graduation ceremony for GFBA’s second Fellows cohort. Rachel Bernier-Green of Laine’s Bake Shop, another second-year Fellow, attributes her growth in large part to GFBA. “When we started we were in, I think, four Whole Foods stores, and we were working in a shared kitchen. Now we’re in our own space, in 15 stores, and onboarding 30 Starbucks next month,” she said. With an impressive lineup of investors, super mentors, mentors and advisors who are actively engaged with GFBA, the opportunities for Fellows to learn and grow their businesses are vast. 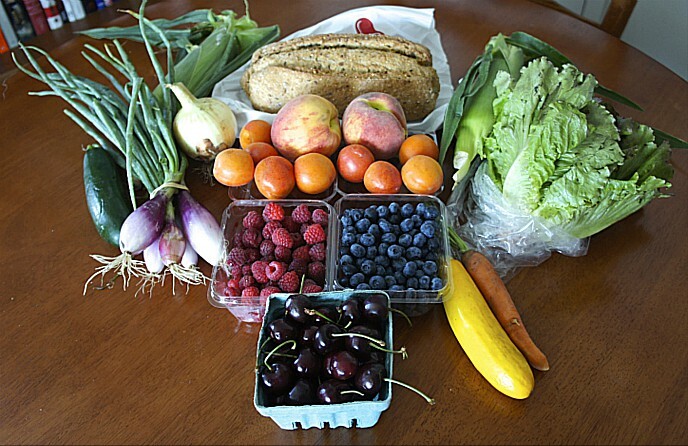 Local and sustainable food is a multi-billion dollar industry, and the market for Good Food is expanding rapidly. The Good Food Business Accelerator Application Celebration event at 1871 on September 13 will feature a thought-provoking discussion on the beneficial impact GFBA has on the Midwest’s food and farm entrepreneurs and their efforts to increase the supply of local, sustainable food. FamilyFarmed is excited to have a panel of our mentors and advisors join us, as well as several GFBA alumni. The evening will close with networking, Good Food, and local beer and cocktails. Reserve your ticket now! 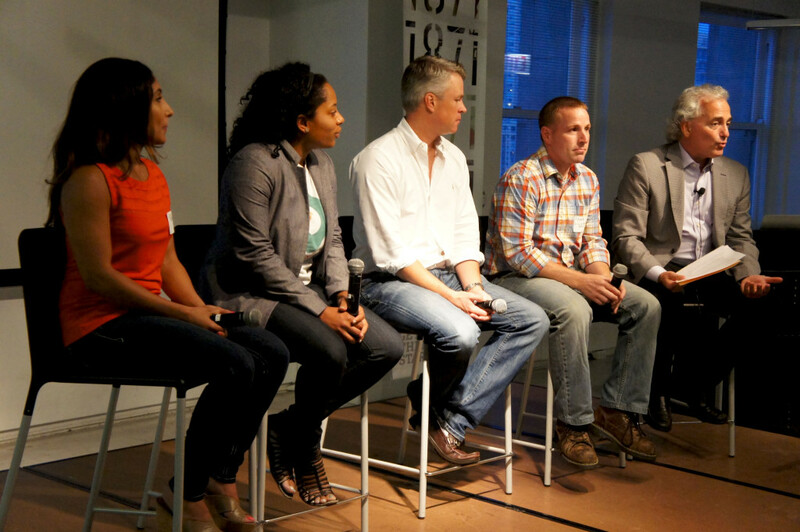 A panel of first-year Good Food Business Accelerator Fellows participated in the September 2015 event at 1871 to promote the upcoming second year of the program. Left to right, Rowida Assalimy of Kishr, Riana Lynn of FoodTrace, Shane Christensen of dailyServing, Mark Schneider of Living Water Farms, and FamilyFarmed President Jim Slama. This entry was posted in Farm businesses, Financing, Food Artisans, Food Entrepreneurs, Good Food and economic development, Good Food Business Accelerator, Good Food business development, Good Food marketing, Good Food Success Stories, Local Food, Regional food systems, Small Farmers, Sustainable food business investment, Sustainable food retailing and tagged business accelerators, FamilyFarmed, Food business accelerators, GFBA, Good Food Business Accelerator, Good Food Festival & Conference, Good Food Financing &Innovation Conference, UNFI, Whole Foods Market. Bookmark the permalink.